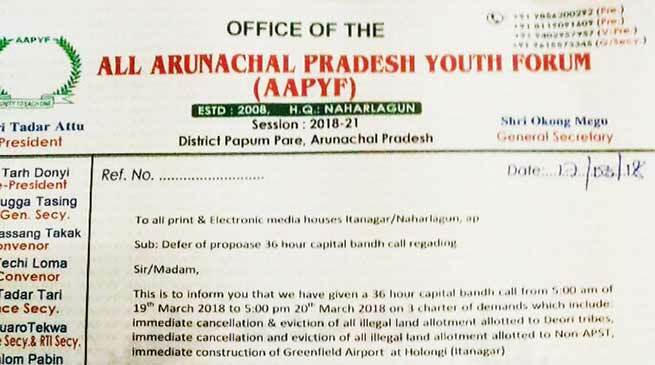 All Arunachal Pradesh Youth Forum (AAPYF) today differ the proposed 36 hours capital bandh call given on three point charter of demand which include immediate cancellation and eviction of all illegal land allotment allotted to Deori tribes, Immediate cancellation and eviction of all illegal land allotment allotted to non APST, immediate construction of green field airport at Hollongi (Itanagar). In a press release AAPYF President Tadar Attu said that there have tremendous pressure by the locals parents of the ongoing CBSE examination and the bandh would badly affect their examination process, moreover the ongoing road construction in capital would also be affected. Attu said that the team of AAPYF have a discussion with the Home Minister Kumar Waii last evening where the matter was discussed which would be taken with Chief Minister and Chief Secretary. He however said that the charter of demand of the union shall remain as it is and they would announced the date of their democratic movement after due consultation of the executive committee members viewing the examination and other important programme which would not affect the common people of the capital complex.